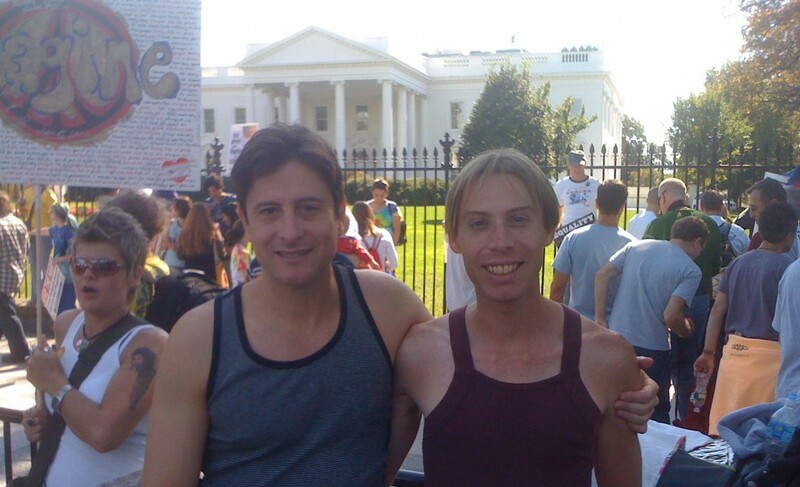 It was thrilling to participate in the National Equality March (NEM) in Washington on Sunday. The event, although smaller than in past years, achieved the desired goal of drawing the nation’ attention to gay, lesbian, bisexual and transgender issues. Democrats in Congress and the Obama administration were also put on notice that an anxiety-filled GLBT community demanded action, not just flowery words. While this was my third march, it was inspiring to see this event through the fresh eyes of Jamie, (left, in red) my partner. He is thirty years old and grew up in a small town in rural Nebraska (population 700). From his vantage point, the march was an extraordinarily life-affirming event. He shared the same look of awe and empowerment that was on the faces of the energetic youth in DC, who will one day become our leaders. Frank believes that instead of marching, GLBT people should organize more efficiently and effectively by becoming more like the National Rifle Association (NRA) or the American Association of Retired Persons (AARP). He is correct that we should organize into a political force, but get real. The GLBT movement can’t be compared to organizations that possess immense constituencies. Botox notwithstanding, we all grow old and that is why AARP has thirty-five million members. America loves guns, which is why even city slickers like John Kerry and Mitt Romney feel compelled to purchase varmint guns and tromp though the fields to whack squirrels. To make up for this obvious deficit in raw numbers, we sometimes must supplement traditional politics with demonstrations, marches and moral persuasion in the media — anything to get America to listen to what we have to say. The march did achieve spotlighting our issues in a way that postcards to the White House never could. As expected, President Barack Obama’ soaring oratory delighted the sold out crowd at the Human Rights Campaign’ national dinner. Make no mistake, the speech was historic, and Obama’ words have significantly more impact now that he is in office, not just a candidate. It was an effective use of the bully pulpit and put him squarely on record supporting equality. Unfortunately, when I woke up, as I told MSNBC, I was still a second-class citizen. We must continue to hold Obama accountable, but also, as the Washington Post editorial board says, pressure Congress to take action. This crude stereotype of nutty and politically unsophisticated radicals typing in their underwear is inaccurate and a risky miscalculation. Indeed, I would venture to say that many of those insisting on swift action – David Mixner, Richard Socarides, John Aravosis and Paul Yandura — likely have more political experience than those questioning the credentials of such critics. These “malcontents” are savvy and influential former insiders who are fighting so that we do not repeat the disappointment of the Clinton years. They are wise and experienced advocates who understand that if we don’t live in the moment, it may slip away. On the other side, we have those who are too hung up on the ghost of Bill Clinton’ presidency, fearing that any move to enact legislation will turn into another Don’t Ask/Don’t tell fiasco. These folks keep telling us to wait for the right moment to take action. The truth is, there will be no right moment. Major issues, such as an economic meltdown, healthcare, Afghanistan and Iran will always be on the president’ plate. Or, there will be an election on the horizon, making politicians skittish about social issues. Thus, there is never a better time to act than the present, or at least the very near future, such as waiting a few months for special strategic concerns. Those preaching infinite patience must remember that 15 years have passed since the Don’t Ask/Don’t Tell debacle. Despite the raucous protests of bigots, most Americans are now mature enough to handle GLBT rights. My own activist philosophy is simple: Never pass up an opportunity to complement the Obama administration or Congress when they earn it. But, never give a pass to politicians who do not embrace full-equality.